I've always wanted to interview my Blue Gelert Plushie. He's so cute, and looks like he would have the personality of Capara Kyrii! Weatherbee: You're SO adorable! Tell me a little about yourself! Weatherbee: Really. You're a quiet fellow! Where did you get those cute little ears? They remind me of my Aunt Tessie's! That didn't turn out the way I hoped. I decided to do an interview with the shopkeeper for Neopian Fresh Food. Weatherbee: First, may I just ask you your name? Shopkeeper: You can, but it won't do you any good. I work for a secret organization, and giving out my name would get me blasted with a ray gun, er, oh nevermind. Weatherbee: *blinks* Ok then... So, you sell food at Neopian Fresh Food? How long have you been in sales? Shopkeeper: Quite a while. I only started selling for Neopian Fresh Food around ten years ago. Weatherbee: Why did you decide to start selling food for Neopians? Weatherbee: Really? You always seemed like such a nice guy! Shopkeeper: Sure! Say, you wouldn't be interested in some Green Cabbage, would ya? I've got a few heads of Green Cabbage, 150 Neopoints a piece. You can't beat that anywhere! Weatherbee: Erm, no thanks... Where did you learn your, uh, selling style? Shopkeeper: Well, ever since I was a young lad, I have been a salesman. I started out with, guess what, lemonade! I would sell lemonade at a stand on my street to all the neighbors for one hundred neopoints a glass. The "glass" was made of paper, the lemons were either old or not yet ripened, and don't even get me started on sweetener. I didn't use any! *hushes voice* Between you and me, I found I made more neopoints by NOT buying sugar! When the Neopians would make a face at my super-sour drink, I would tell them that drinking straight lemon juice would make their hair grow. It worked especially well on the old folks, and tripled my sales! I was quite the little entrepreneur. After selling my lemonade, I decided to move on to selling plushies. They were THE toys to have! Stuffed with our softest, finest cardboard, and sewn with my own two hands. I got so good at it, I started using my feet! I even drew the eyes, nose and mouth with my best pencil! 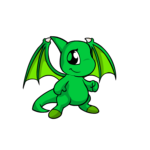 Couldn't find finer quality plushies anywhere in Neopia, unless you looked around. It all went well for about six months, until that chubby-cheeked Cybunny over at the Plushie Palace took all my customers from me. *throws fist in the air, and brings it down with a thud* Must have lost my temper there. Heh. Once my plushie business was ruined, I nearly called it quits. Luckily, during my last year at the Swashbuckling Academy, I noticed my real flair for food! I could whip up almost anything in any given time. I could turn a sock into a delectable treat! *holds up a pair of Edible Purple Socks* Try one? Weatherbee: No thanks... Go on! Shopkeeper: Suit yourself! Where was I... Oh! I decided to open up my own food shop, which is where I work today. Like I said, it has been open for a little over ten years now, and is the reason I am a multi-millionaire. Weatherbee: Wow, you are QUITE the entrepreneur. Do you have any plans for the future? Weatherbee: Erm, I actually meant what do you have planned for the future for Neopian Fresh Food? Shopkeeper: Ah! Silly me. I plan on opening up a few more stores. One on Mystery Island, another on Kreludor, and another in the Kiko Lake region. I think that the more cultures I can sell my delicious food to, the more neopoints I will bring in! I am looking to see a ten percent profit increase this year, and possibly another two percent from this wonderful interview with you. Weatherbee: Anything to help out such, er, a great member of Neopian Society. Do you plan on working in the food industry as long as you're able? Weatherbee: *takes a few steps back* Well, thank you so much, Mr. Shopkeeper, for this lovely, informing interview. Please help yourself to your free copy of the Neopian Times next week, where you will be featured! Princess Lunara gazed out of her window as another flying ship pulled into the dock. "Tomorrow is Petpet Day, where the students are entitled to bring their Petpets to school. Food and toys will be provided for all pets. Don't miss out."